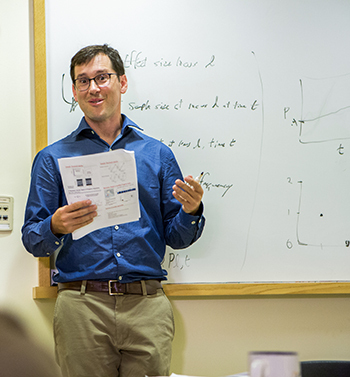 GSA is proud to congratulate GENETICS author John Novembre, who was recently named a 2015 MacArthur Fellow or “MacArthur Genius.” Novembre is a computational biologist whose research focuses on understanding human evolutionary history. His research findings have improved the field’s knowledge of human migratory patterns and demonstrated a correlation between shared ancestral geography and genetic similarity among Europeans. These findings make it possible for a person’s ancestry to be pinpointed within several hundred miles based on his or her genetic markers. In this brief video, Dr. Novembre describes his current scientific interests, which investigate ways to analyze complex genetic data to learn more about evolution, genetics, and disease. The MacArthur Fellows Program awards unrestricted fellowships to talented individuals who have shown extraordinary originality and dedication in their creative pursuits and a marked capacity for self-direction. There are three criteria for selection of fellows: exceptional creativity, promise for important future advances based on a track record of significant accomplishment, and potential for the fellowship to facilitate subsequent creative work. Fellows receive a $625,000 stipend over 5 years, with no strings attached to encourage creativity during the term of the grant.